We had such a blast collaborating with the awesome Cassi Claire on this editorial shoot. We dreamt of a mix of blush, chartreuse, and grey with pops of our favorite metallic of all—rose gold! Our style board is where it all began—it dives into all things colors, textures and overall vibes. We wanted to create a romantic, ethereal setting for Cassi to capture! The Inn at Fernbrook Farms was seriously the perfect setting for this romantic shoot. The inn's charming exterior and the lavish grounds were oh-so-breathtaking. And check out the paper goods! All so pretty with rose gold details designed by Sincerely Jackie and stunning calligraphy by Everly Calligraphy. Isn't our bride super gorgeous? She's adorned from top to bottom in Alexandra Grecco (along with the bridesmaids!) and holds pretty florals by Viburnum Designs. The ladies' hair and make-up styled by the talented Sissi Chan. Everything was so magical about this shoot, from the venue to the gowns to the flowers and more! Head on over to 100 Layer Cake to see the post! It's pretty much a given that we love all things colorful, so of course we were in awe when we came across this gorgeous tabletop. We're drooling over the mix of fun and whimsical patterns, and of course that little parasol drink umbrella is the icing on the cake! The arrangement of peonies and poppies goes perfectly ... we can just go on and on about how stunning this tablescape is! What's your favorite part of this vignette?? Happy Tuesday! With the July 4th holiday coming up, we wanted to share this fun and playful twist on red, white and blue! We love the graphics of the anchor, ship and rope on the plates! So bold and nautical. And that striped linen is the perfect backdrop to the overall look. Hope everyone has a wonderful and safe holiday!!! We heart all things Kate Spade, so of course fell in love with this tablescape inspiration upon first glance! Isn't it lovely?? The pops of pink and gold, the assortment of patterns, the gorgeous ranunculus in milk vases and those adorable succulents ... all so beautifully put together! Wouldn't this be cute for a bridal shower?? Summer's just three days away and we're itching to hit the beach! How sweet would it be to have a little soirée right on the sand just like this?? So natural yet whimsical! We love the neutral backdrop, really allows for the pinks and greens to pop. And those bullrushes (aka the wetland plant that looks like a corndog) are super cute!! Don't you agree? While the heat is bit crazy town in Texas, we know the succulents at our house are loving it! So we're inspired and crushing on this lovely succulent tablescape today. We love how the succulents are in clear glass hurricanes. Normally we see them in clay pots or other containers, so this is a neat way to take display them! 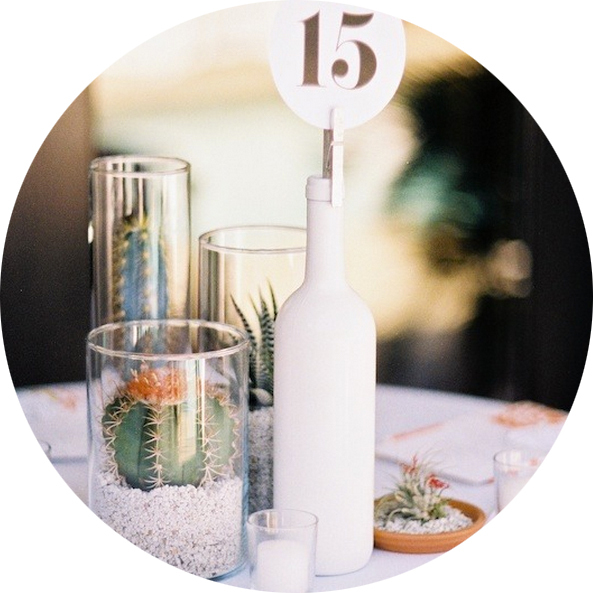 The white wine bottle and the table number is cute and simple -- overall just a fun and natural look! What do you think? ?